Wait – before you toss that into the garbage, can it be recycled? Many things obviously can in traditional ways, but an artist often sees beyond the obvious. 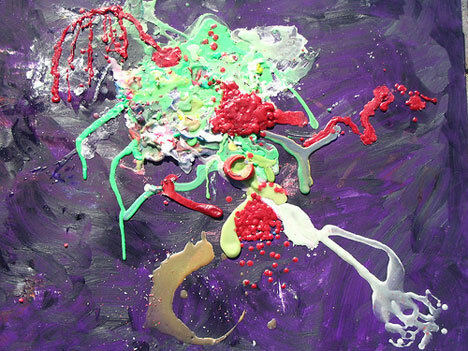 With a creative eye and artful touch, art can be created with nearly any medium. 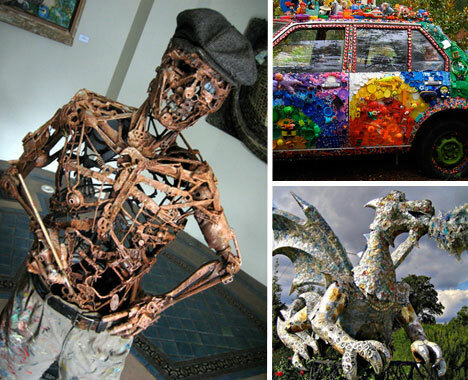 Innovative artists can transform what you might consider trash into amazing art. If you thought that fried motherboard was utterly useless, you were wrong. To an artist, it can be a beautiful opportunity. 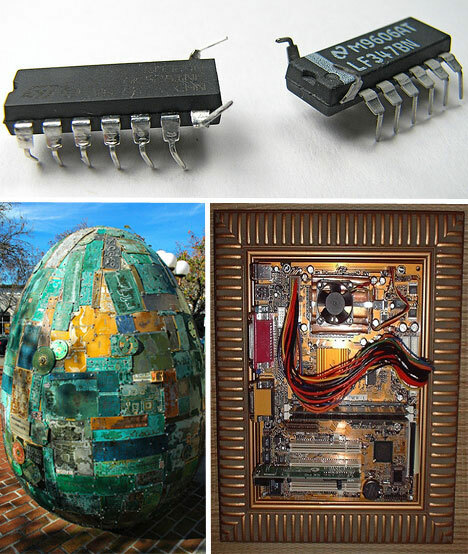 In Palo Alto, California, a seven-foot tall egg made from computer circuit boards is on public display as part of the Digital DNA project. The egg is a symbolic representation of the city’s mother role to Silicon Valley. 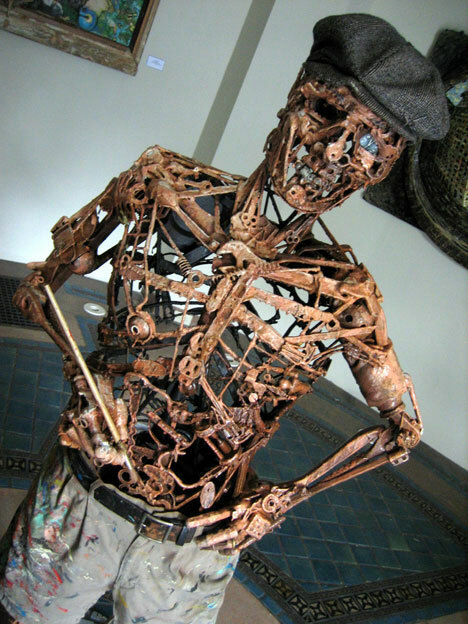 Art made from recycled computer parts can be whimsical to thought provoking. Art knows no limitations. 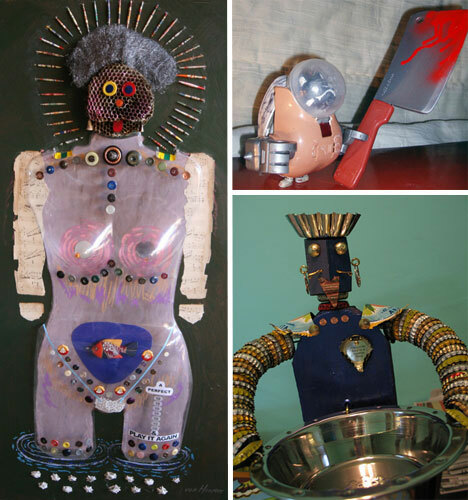 Through sense of humor or a disturbed mind, some artists are able to take everyday objects that are broken or discarded and compose them into a visual assault. Scrap metal, wire, old toys or bottle caps are sometimes the stuff of which these fascinating nightmares are made. Empty water bottles are plentiful and make an interesting artistic medium. 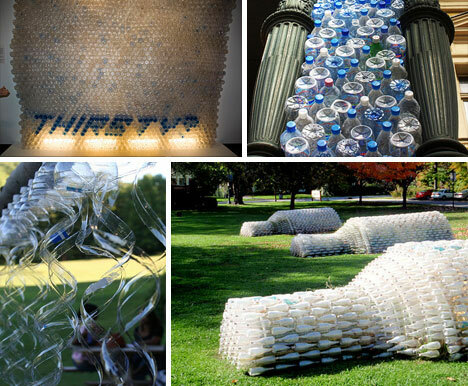 Giant bottles made of recycled plastic bottles are tipped over on the grass at an art installation in North Evanston, Illinois. Approximately 6,000 small, clear plastic bottles were used to construct the five 16-foot bottles on display. Guests to the exhibit slip messages inside the bottles for other guests to read, making it an interesting community project. Sometimes artwork can be done purely for the joy of it, with no method or meaning. After the birthday cake is gone, you might try your hand at some artwork, rather than throwing the candles away. This candlewax art was done on a whim. It didn’t please the artist, and eventually ended up in the garbage anyway. Decorating cars with recycled items is so popular there are even competitions to see who can come up with the most creative designs. School children got in on the fun and artfully pimped a ride as a classroom project. 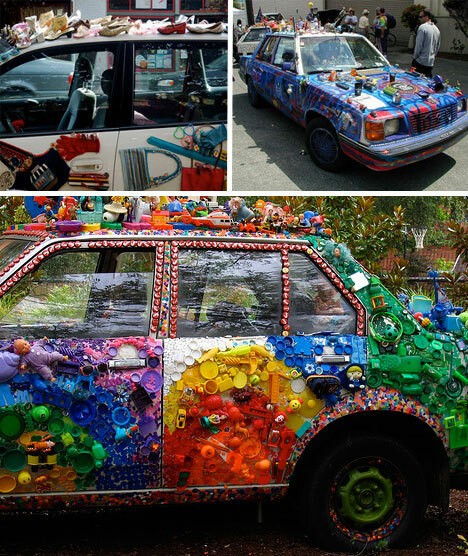 Using a little of this, a little of that, and some bold colors they recycled and decorated a car at the same time. 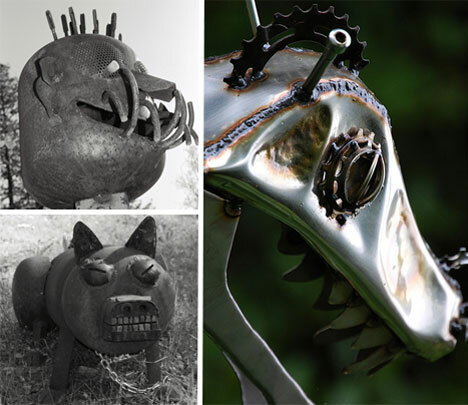 Scrap metal parts and pieces are often a favorite industrial art medium. Although immobile, these whimsical pieces seem to have personalities that pop. 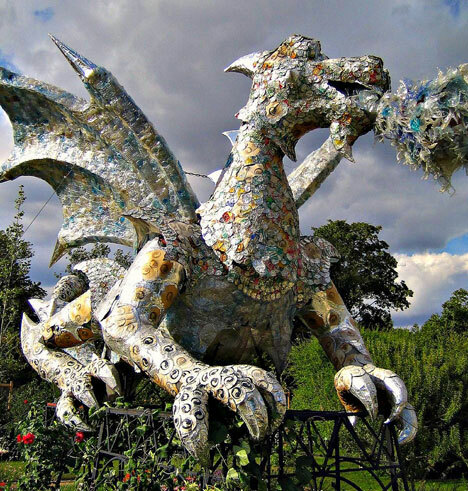 This friendly looking dragon, made of flattened aluminum cans, is on display at the Paris Zoological Park at the Jardin de Plantes. 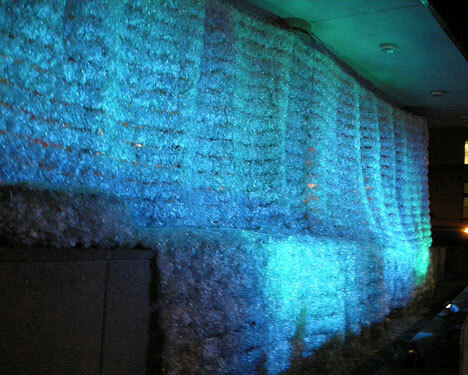 This wall of water art installation by Katharine Harvey was displayed on the north side of the Ontario Power Generation Building. Harvey constructed this project by shaping recyclable plastic bottles into ripples with nylon netting. Theatrical lighting adds the final touch to this dramatic artwork. 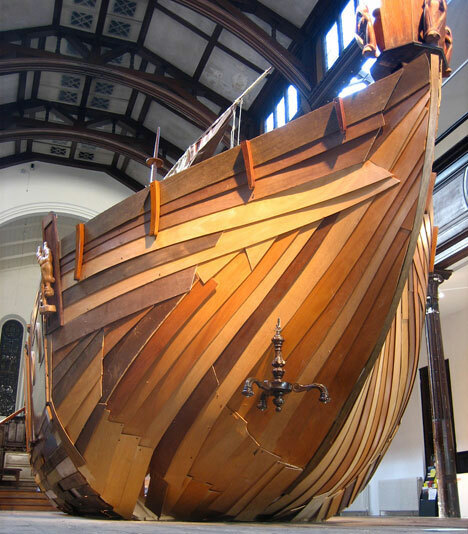 This amazing ship looks as though it’s ready to set sail, although it’s actually an art installation in the Fabrica building in Brighton. The ship was constructed entirely of second-hand furniture. The warmth of wood makes it a popular medium for artists and stunning pieces like this one can be created using reclaimed materials. 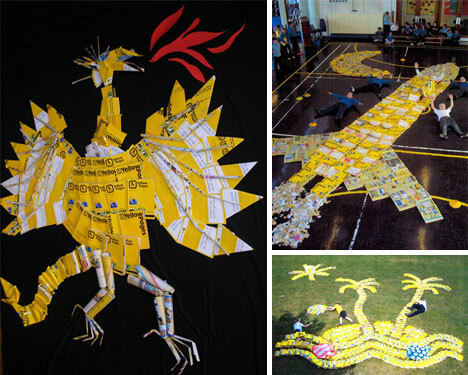 School children recycled yellow page directories to created six pieces of unique art for the Big Yellow Pages Art Competition. Projects like this may soon be a thing of the past as more people go green and opt out of receiving printed yellow page directories. Art can be cute, soft and cuddly. These dolls were put together using recycled and reclaimed materials, making them all the more adorable and unique. 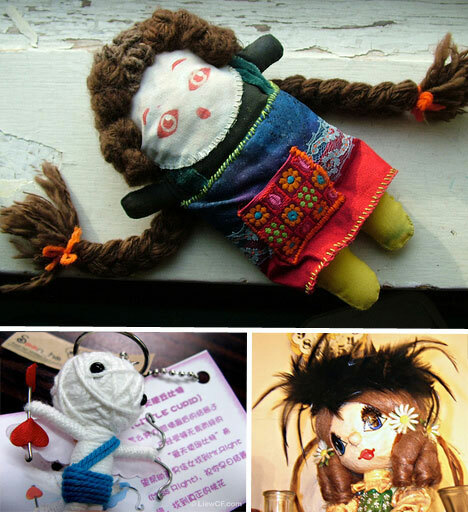 Whether sewn, crocheted, wrapped in yarn, or made from recycled paper, a handmade doll is a special treasure. The garbage and recycling center in San Francisco offers fellowships to artists who use recycled materials. 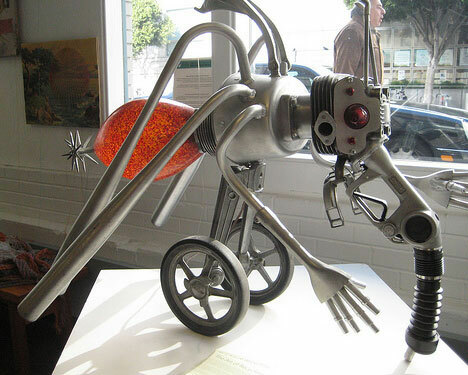 This odd looking robotic mosquito, looking for its first blood, was a recycled artwork project. Repurposing the materials into exciting artwork keeps these objects out of landfills and eliminates the costs of traditional recycling. 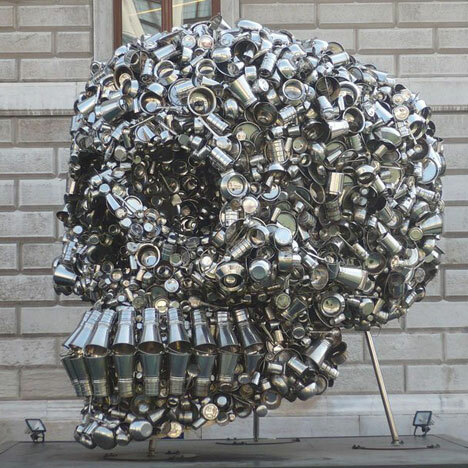 This slightly morbid, yet fascinating human skull was constructed of reclaimed metal cans, pots, pans and bowls. On display, it seemingly floats above the stage snd can be viewed from all angles. Spotlights allow it to shine at night, an eerie reminder of the human condition.